This pretty pot of petunias welcomed us to the home of our friends' parents, who offered 8 of us a weekend stay on Pender Island. Their home is on the water, with a dock where we caught sweet Rock Crabs. Although the weather is feeling autumnish, we sat at the picnic table outside and cracked crabs without worrying about the mess. It was a great start to dinner. We all provided elements of the dinner so it wasn't a lot of work for any one person. My contribution was dessert - a maple-flavoured unbaked cheesecake with a ginger cookie crust and roasted pears on top. It's a light cheesecake, which was a good thing because we certainly had a sumptuous dinner to precede it. We did go for a hike before dinner. The weather alternated rain and cloud with sun and blue sky. From the top of Oak Bluff, the misty blue islands and silvery water of the Salish Sea look like something out of Tolkien, or C.S. Lewis' works. Far over wood and mountain tall." And then the sun came out for a wee bit. It's feeling very autumn-ish here these days. Lots of rain and wind, although nothing like that of Hurricane Florence. A LOT of deer live on Pender Island. I startled this mama and baby who were napping in a quiet spot. They stood and looked at me for a long time before ambling off into the woods. Lorrie, what a magical weekend! I've not had Rock Crab before but I do like crab! And the fact that you caught them yourselves - extra Yum! And your dessert sounds perfect. Lovely photographs! I think the deer were waiting for cheesecake! Looks as if you enjoyed a wonderful and refreshing weekend. Still summer hot and humid here. I’d welcome a crisp fallish day. Your dessert looks like the perfect counterpoint to a rich lobster dinner … and I am sure I would have been grateful to burn off a few calories on that hike beforehand! Isn't this a great time of year for interesting photos? Love your close-ups! Looks like a lovely, lovely weekend . . . full of friendship, flavor, and beauty. Your cheesecake looks divine! And the deer photo is my favourite - they have such big eyes <3 Yes, it is very much autumn here too - no floods, no hurricane - so we are safe. I pray for all who are at the mercy of weather. Pender Island looks like a lovely place to spend time. The cheesecake looks delicious with that ginger cookie crust. Lovely photos of a beautiful spot! Your cheesecake looks delicious. What a lovely spot for the 8 of you to spend a weekend - the food - especially your cheesecake, the scenery, the company, it all looks perfect. What a kind gesture from your friends to share their special place with you all for a last farewell to summer break. Your post has a wonderful autumn feel to it, love the shot of Bambi & Mom. An al fresco dinner of rock crabs and cheesecake after a hike through the woods sounds like the perfect way to relax. Blimey with cheesecake talents like that, I bet you're invited all over the place! What a wonderful weekend. Glad you got to see some sunshine too! Your cheesecake looks and sounds wonderful. Those deer are so beautiful. Wasn't that sweet of your friends" parents to lend their home? Pender Island looks like a lovely place to visit. Your cheesecake looks professionally made, Lorrie! What a magical visit to Pender Island! Beautiful. The cheesecake made my mouth water! I enjoyed this post for Mosaic Monday - wish you a very good week. We love Pender Island! Your photos capture its beauty. Your weekend sounds wonderful...the crabs must have been tasty and your cheesecake looks delicious! Looks magical, what an amazing weekend. The cheesecake looked delicious, I bet it wasn't there long. What a lovely little getaway. Your cheescake looks so good. I'm also admiring your great shot of the deer. It's like I can reach out and touch their fur. Lovely accommodations, good friends, devious food and a dose of nature thrown in for good measure. We are experiencing extended summer in the east. It was 37' on Saturday with the humidex. Everyone in the pool cooling off. It really does look Tolkenish ...those twisted trees look able to talk to us! So lovely, so green. Out- of-doors is the only good way to enjoy fresh crab...and dessert looks more than perfect. (Smiled at your post title too). Pender Island looks idyllic, surrounded by the sea as well as having interesting hiking trails. How kind of your friends parents to welcome eight of you! I’m sure they enjoyed your company and what a delicious desert you created Lorrie! We all want to hold on to those special Autumn days, it’s always been my fave season! When I read your post with see your lovely photos it inspires my to get back to my blog! I might try and put something up this weekend! I’m so excited about Mary and Bob’s visit to Canada - it will be a lot of fun! Lovely selection of photographs again. Your cheesecake looks delicious and those deer so sweet. Good food and friendship-- a winning combination. Well I may not see Pender Island - which looks lovely - but I know I'll enjoy Victoria as always, and even moreso this time meeting up with you guys! I loved that you were able to still enjoy eating al fresco - and your dessert looked so good. to say that for a lot of years!!!!!! Your photos are amazing and the cheese cake looks so very good. Any chance of sharing how it's made possibly? What a lovely weekend. Just the best kind. 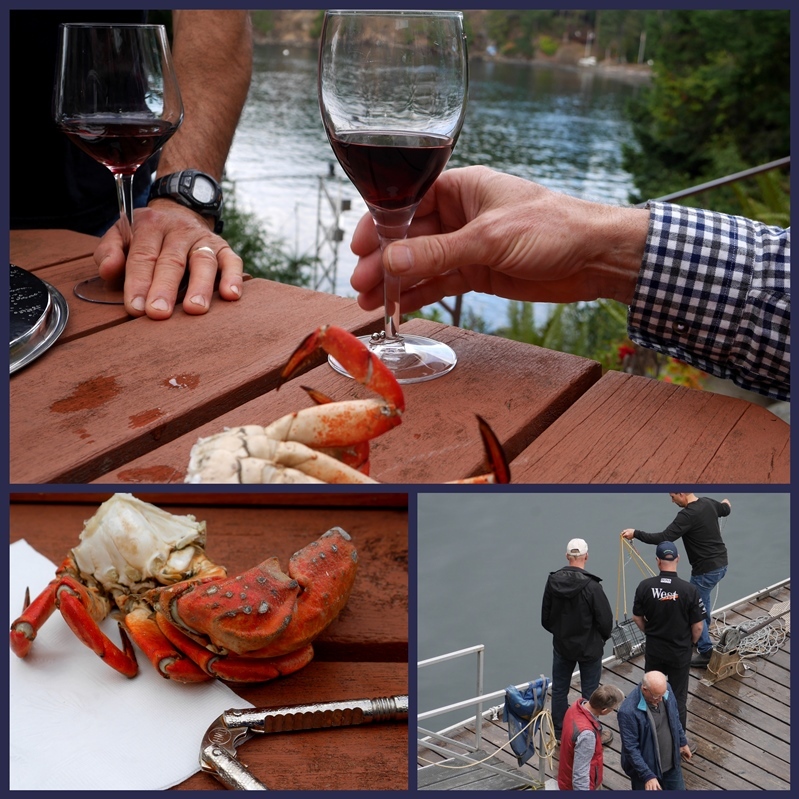 Sounds like you had a great weekend on Pender Island. Your photos are perfect. Your cheese cake looks delish. It doesn't feel like fall yet here in Western Kentucky but I am ready for cooler weather. What a wonderful autumn atmosphere in this post. The colours and light are serene and a little bit mysterious. The cheese cake looks so very delicious and your capture of the two deer is perfect. What glorious pictures, dear Lorrie, and oh, your cheesecake looks divine! And may I just saw that I am in awe of the picture of the deer...what sweetness! What a perfect photo of the deer family! You were so lucky to be there at the right time and now you have this great photo to remind you of this special weekend. Now I want to try ginger cookies for a cheesecake crust sometime!